The Roman Rite (Latin: Ritus Romanus) is the most widespread liturgical rite in the Catholic Church, as well as the most popular and widespread Rite in all of Christendom, and is one of the Western/Latin rites used in the Western or Latin Church. The Roman Rite gradually became the predominant rite used by the Western Church. Many local variants, not amounting to distinctive Rites, existed in the medieval manuscripts, but have been progressively reduced since the invention of printing, most notably since the reform of liturgical law in the 16th century at the behest of the Council of Trent (1545–63) and more recently following the Second Vatican Council (1962–65). The Roman Rite has been adapted over the centuries and the history of its Eucharistic liturgy can be divided into three stages: the Pre-Tridentine Mass, Tridentine Mass and Mass of Paul VI. 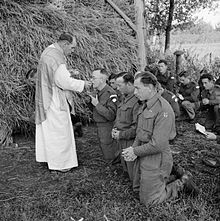 The Mass of Paul VI is the current form of the Mass in the Catholic Church, first promulgated in the 1969 edition of the Roman Missal. It is considered the ordinary form of the mass, intended for most contexts. The Tridentine Mass, as promulgated in the 1962 Roman Missal, may be used as an extraordinary form of the Roman Rite, according to norms set in the 2007 papal document Summorum Pontificum. The Roman Rite is noted for its sobriety of expression. In its Tridentine form, it was noted also for its formality: the Tridentine Missal minutely prescribed every movement, to the extent of laying down that the priest should put his right arm into the right sleeve of the alb before putting his left arm into the left sleeve (Ritus servandus in celebratione Missae, I, 3). Concentration on the exact moment of change of the bread and wine into the Body and Blood of Christ has led, in the Roman Rite, to the consecrated Host and the chalice being shown to the people immediately after the Words of Institution. If, as was once most common, the priest offers Mass while facing ad apsidem (towards the apse), ad orientem (towards the east) if the apse is at the east end of the church, he shows them to the people, who are behind him, by elevating them above his head. As each is shown, a bell (once called "the sacring bell") is rung and, if incense is used, the host and chalice are incensed (General Instruction of the Roman Missal, 100). Sometimes the external bells of the church are rung as well. Other characteristics that distinguish the Roman Rite from the rites of the Eastern Catholic Churches are frequent genuflections, kneeling for long periods, and keeping both hands joined together. In his 1912 book on the Roman Mass, Adrian Fortescue wrote: "Essentially the Missal of Pius V is the Gregorian Sacramentary; that again is formed from the Gelasian book, which depends on the Leonine collection. We find the prayers of our Canon in the treatise de Sacramentis and allusions to it in the 4th century. So our Mass goes back, without essential change, to the age when it first developed out of the oldest liturgy of all. It is still redolent of that liturgy, of the days when Caesar ruled the world and thought he could stamp out the faith of Christ, when our fathers met together before dawn and sang a hymn to Christ as to a God. The final result of our inquiry is that, in spite of unsolved problems, in spite of later changes, there is not in Christendom another rite so venerable as ours." In a footnote he added: "The prejudice that imagines that everything Eastern must be old is a mistake. Eastern rites have been modified later too; some of them quite late. No Eastern Rite now used is as archaic as the Roman Mass." In the same book, Fortescue acknowledged that the Roman Rite underwent profound changes in the course of its development. His ideas are summarized in the article on the "Liturgy of the Mass" that he wrote for the Catholic Encyclopedia (published between 1907 and 1914) in which he pointed out that the earliest form of the Roman Mass, as witnessed in Justin Martyr's 2nd-century account, is of Eastern type, while the Leonine and Gelasian Sacramentaries, of about the 6th century, "show us what is practically our present Roman Mass". In the interval, there was what Fortescue called "a radical change". He quoted the theory of A. Baumstark that the Hanc Igitur, Quam oblationem, Supra quæ and Supplices, and the list of saints in the Nobis quoque were added to the Roman Canon of the Mass under "a mixed influence of Antioch and Alexandria", and that "St. Leo I began to make these changes; Gregory I finished the process and finally recast the Canon in the form it still has." In the same article Fortescue went on to speak of the many alterations that the Roman Rite of Mass underwent from the 7th century on (see Pre-Tridentine Mass), in particular through the infusion of Gallican elements, noticeable chiefly in the variations for the course of the year. This infusion Fortescue called the "last change since Gregory the Great" (who died in 604). The Eucharistic Prayer normally used in the Byzantine Rite is attributed to Saint John Chrysostom, who died in 404, exactly two centuries before Pope Gregory the Great. The East Syrian Eucharistic Prayer of Addai and Mari, which is still in use, is certainly much older. 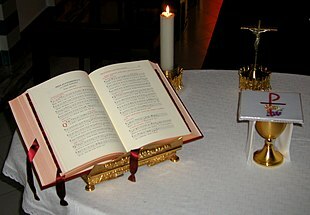 The Roman Missal (Latin: Missale Romanum) is the liturgical book that contains the texts and rubrics for the celebration of the Mass in the Roman Rite of the Catholic Church. Before the high Middle Ages, several books were used at Mass: a Sacramentary with the prayers, one or more books for the Scriptural readings, and one or more books for the antiphons and other chants. Gradually, manuscripts came into being that incorporated parts of more than one of these books, leading finally to versions that were complete in themselves. Such a book was referred to as a Missale Plenum (English: "Full Missal"). In response to reforms called for in the Council of Trent, Pope Pius V promulgated, in the Apostolic Constitution Quo primum of 14 July 1570, an edition of the Roman Missal that was to be in obligatory use throughout the Latin Church except where there was a traditional liturgical rite that could be proved to be of at least two centuries’ antiquity. The version of the Mass in the 1570s edition became known as the Tridentine Mass. Various relatively minor revision were made in the centuries following, culminating in the 1962 edition promulgated by Pope John XXIII. Pope John XXIII opened the Second Vatican Council that same year, whose participating bishops ultimately called for renewal and reform of the liturgy. The 1969 edition of the Roman Missal was promulgated by Pope Paul VI, issued in response to the council, introduced several major revisions, including simplifying the rituals and permitting translations into local vernacular languages. The version of the Mass in this missal, known colloquially as the Mass of Paul VI, is currently in use throughout the world. 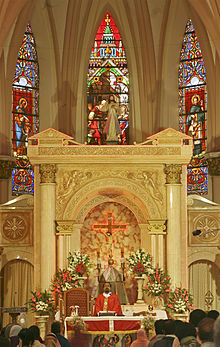 The Roman Rite no longer has the pulpitum, or rood screen, a dividing wall characteristic of certain medieval cathedrals in northern Europe, or the iconostasis or curtain that heavily influences the ritual of some other rites. In large churches of the Middle Ages and early Renaissance the area near the main altar, reserved for the clergy, was separated from the nave (the area for the laity) by means of a rood screen extending from the floor to the beam that supported the great cross (the rood) of the church and sometimes topped by a loft or singing gallery. However, by about 1800 the Roman Rite had quite abandoned rood screens, although some fine examples survive. Western ears find the traditional chant of the Roman Rite, known as Gregorian chant, less ornate than that of the Eastern rites: except in such pieces as the graduals and alleluias; it eschews the lengthy melismata of Coptic Christianity, and, being entirely monophonic, it has nothing of the dense harmonies of present-day chanting in the Russian and Georgian churches. However, when Western Europe adopted polyphony, the music of the Roman Rite did become very elaborate and lengthy. While the choir sang one part of the Mass, the priest said that part quickly and quietly to himself and continued with other parts; or he was directed by the rubrics to sit and wait for the conclusion of the choir's singing. It thus became normal in the Tridentine form of the Roman Rite for the priest to sing no part of the Mass, merely speaking the words, except on special occasions and in the principal Mass in monasteries and cathedrals. ^ Lott, J. Bert (2012-08-30). Death and Dynasty in Early Imperial Rome: Key Sources, with Text, Translation, and Commentary. Cambridge University Press. ISBN 9781139560306. ^ "Bishop succinctly characterizes the 'genius of the Roman rite' as being 'marked by simplicity, practicality, a great sobriety and self-control, gravity and dignity'" (James Norman, Handbook to the Christian Liturgy - Regional Rites V). Baldovin, SJ., John F., (2008). Reforming the Liturgy: A Response to the Critics. The Liturgical Press. Metzger, Marcel. History of the Liturgy: The Major Stages. 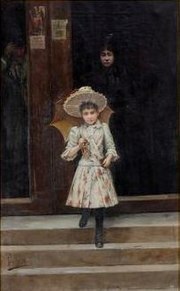 Beaumont, Madeleine M. (trans.). The Liturgical Press. Morrill,SJ, Bruce T., contributing editor. Bodies of Worship: Explorations in Theory and Practice. The Liturgical Press. Foley, Edward; Mitchell, Nathan D.; and Pierce, Joanne M.; A Commentary on the General Instruction of the Roman Missal. The Liturgical Press.